TGIF! My Friday is quickly getting away from me and I have so many things to do! We're heading over to the island for my cousin's wedding and I'm so excited. I get to do her makeup for the big day, so right after this, I've got to take inventory and then run out to pick up the extra odds and ends that I don't have. I kind of miss doing wedding makeup (especially since I've had my own makeup done so much lately and am always so critical of it) and I'm so excited to make her look stunning on her wedding day. I've been practicing different looks on myself as well and it's making me want to be a bit more adventurous with my own makeup. I've been doing the same ultra natural look with a cat eye for the last year or so and I think it's time to switch it up a bit. I'll do some more videos on them as well so that you can see how I do it. We took these photos on a super windy day down by the water. We've been having some crazy windstorms lately and I sort of love it. The sound of the wind and the leaves blowing everywhere make it really feel like fall. The thing that ruins it is when the rain starts up. I don't like that part too much. My hat did almost blow off a few times, but we were lucky to catch enough in-between moments where I don't look like I'm about to be swept away. And yes, like I said earlier this week -- I've have become particularly obsessed with turtlenecks at the moment. Don't know how long this will last, but they sure are keeping me warm! 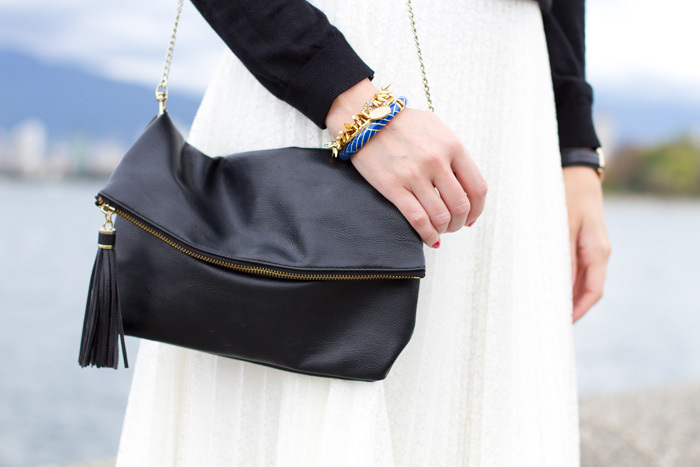 It's the perfect way to get away with bare legs for a little while longer. 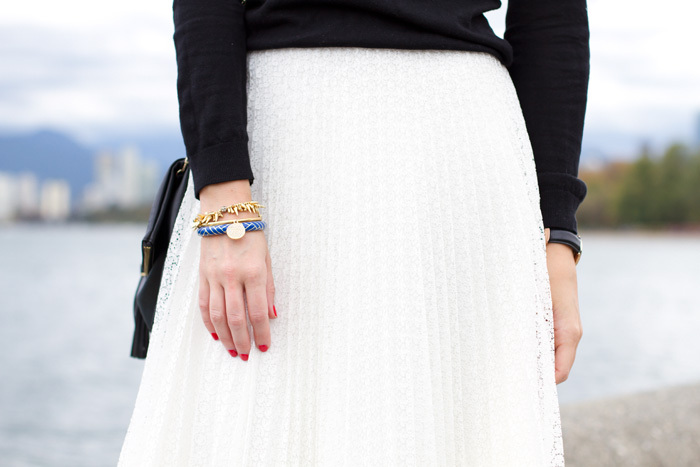 And it also turns out to be the perfect way to transition a white midi skirt for fall! I'm so happy to get a bit more wear out of this skirt. I wasn't at all ready to put it away just yet. Such an amazing look! Especially love the hat, so pretty! I cant wait to see your make up pics and videos!